As warm weather approaches us in Columbus, OH, many homeowners are thinking about ways to minimize their energy costs. While we cannot control the cost of the energy we use, we can control how we use it. In this post, we’d like to give you some options to consider that may help you save on your cooling this summer. If your AC is getting older or requires frequent repairs, you might like to consider replacement, but there are often some relatively minor steps you can take to maximize your cooling performance and energy efficiency. For more information, call the Columbus, OH air conditioning experts at Quality Air Heating and Air Conditioning today! Routinely clean and replace your air filter: This is one of the easiest ways to improve your cooling system. While your air filter is designed to prevent the passage of dust, debris, and pollutants into your living space, when it becomes dirty or clogged, it actually impedes your airflow. This counter-productiveness not only reduces the energy efficiency, but also can damage some aspects of your system and overwork your AC unit. Enroll in a maintenance plan: There’s simply no substitute for professional attention. By enrolling in a maintenance plan, you ensure that your system will be inspected, cleaned, and evaluated on an annual basis. This improves the energy efficiency of your system, extends the life of your system, and may be necessary to uphold the manufacturer’s warranty. Moreover, you may also be eligible for significant discounts on repairs and priority service. Keep it clean: Making sure that your AC unit and area surrounding it is free and clear of dust, organic matter, and any potential objects that could block airflow is necessary to maintaining its energy efficiency and cooling performance. These are just a few of the things you can do to ensure that you don’t pay more than what is absolutely necessary to run your cooling system this summer. You don’t have to sacrifice your comfort in order to minimize energy costs. 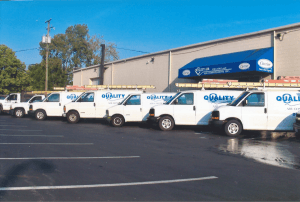 For more information about what you can do to maximize your cooling this summer, call the Columbus, OH air conditioning experts at Quality Air Heating and Air Conditioning today!